PLOT: David Mann (Dennis Weaver), a mild mannered electronics salesman, is driving cross-country on a two-lane highway when he encounters an old oil tanker driven by an unseen driver who seems to enjoy annoying him with dangerous antics on the road. Unable to escape the demonic big rig, David finds himself in a dangerous game of cat and mouse with the monstrous truck. When the pursuit escalates to deadly levels, David must summon his inner warrior and turn the tables on his tormentor. TAGLINE: Terror in your rearview mirror! 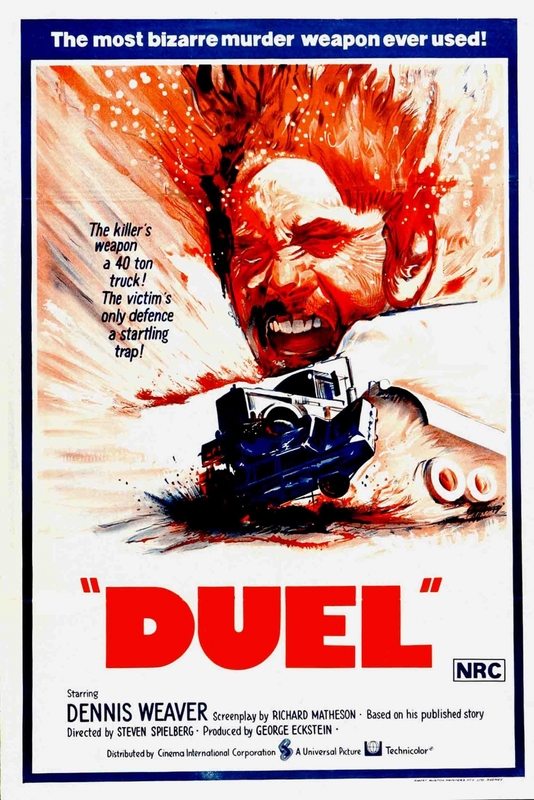 You can hear the views of the team below in our video and audio podcasts or scroll down to the bottom to see our review scores and where Duel stands on the MovieMuse Film Club leaderboard. Simon - "the evilist thing on 4, 6, 8 wheels or however many it has!" Gordon - "Had there been an explosion I'd have gone to 4.5"
Mat - "One of my top 5 Steven Speilberg films"
A film that is as thrilling and entertaining as it is well shot and directed. Only the lack of an explosive ending detracts from a superb feature debut for a true movie icon.